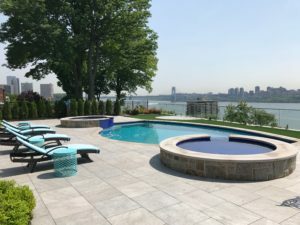 Cipriano Landscape Design & Custom Swimming Pools indoor and outdoor pool design ideas come from the diverse background of our NJ landscape, swimming pool and masonry professionals. Our interdisciplinary approach to swimming pool designs leads to the grounded innovation of functional, aesthetically pleasing outdoor living spaces. The Cipriano design team produces detailed luxury pool designs that meet your every need while maintaining a clean, beautiful look in the landscape. We have designed and built luxury pools in every size and style. Modern, natural, Old World, classical and formal designs have been implemented on nearly every type of property, big and small. 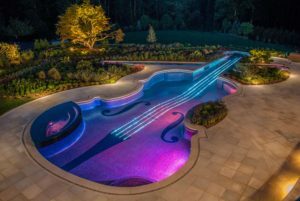 In addition to creative sizes and styles, we are experienced designers and builders of the most technically difficult structures, such as Glass tile, vanishing edge and perimeter overflow swimming pools. Our team has earned over 90 awards for swimming pool designs, pool landscaping, and masonry work, including 17 international design awards. Roughly 85% of these awards have featured glass tile, fiber optic lights, vanishing edge features or custom waterfalls. In other words, some of our most highly acclaimed works of landscape architecture feature the most challenging luxury options available. 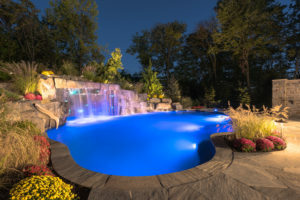 When designed and implemented properly, waterfalls, glass tile, and fiber optic lighting have outstanding effects on complete luxury pool designs. 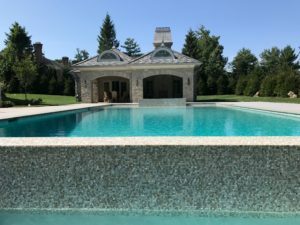 Licensed landscape architect Bill Moore, in-field design expert Chris Cipriano, and Certified Building Professional Keith Steinhoff form the perfect pool design and construction trio. Bill’s creativity, Chris’ natural stone expertise, and Keith’s in-depth technical knowledge keeps the pool design ideas rolling from start to finish. 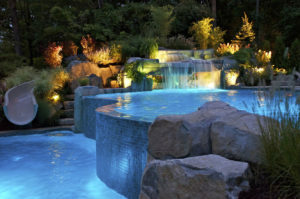 Beyond simply a successful pool design, our landscape and masonry experience give your inground pool a proper setting. Natural stone patios, lush gardens, and outdoor kitchens add some well-deserved functionality and fitting scenery.